This post is sponsored by al fresco. Need a weeknight dinner in a hurry? 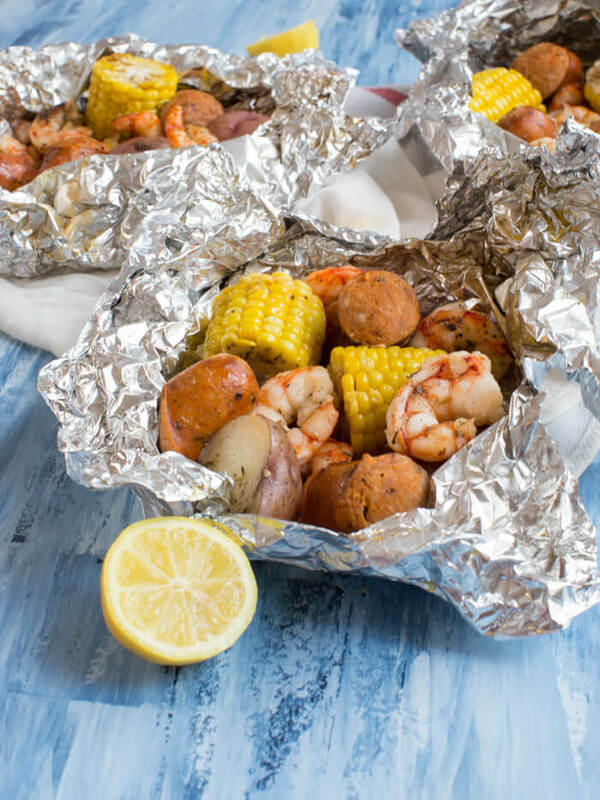 No problem with these Low Country Boil Foil Packs! AKA there’s less mess in the kitchen. 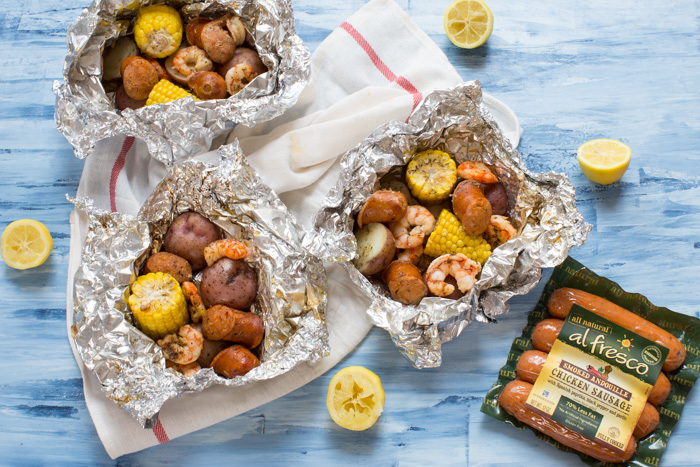 The traditional low country boil just got easier with these Low Country Boil Foil Packs that are ready for the grill, any day of the week! These packs are less fuss and take only minutes to put together. The best part about grillable foil packs? Toss them in the trash when you’re done! Easy clean up. Who likes washing dishes anyways? 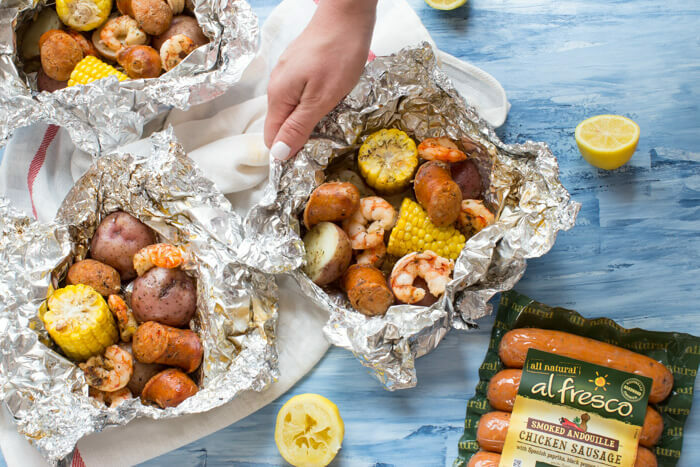 These Low Country Boil Foil Packs are full of lean protein thanks to al fresco Smoked Andouille Chicken Sausage. This chicken sausage is slightly spicy making it the perfect pair to the sweetness from the fresh corn, shrimp, and potatoes. But the best thing about al fresco chicken sausage— it’s fully cooked!! Making it a quick and easy substitute for not only sausage but anywhere you would use chicken. al fresco is a brand that has long been a mainstay in our fridge because of flavor, convenience, and nutrition. al fresco creates more than 30 flavorful and healthy chicken products, including breakfast sausage and meatballs, using 100% all natural ingredients. Because al fresco products are made from chicken they are at least 50% less in fat than traditional pork or beef products, so it is a great choice if you are looking to eat healthier and need convenience but don’t want to sacrifice flavor. 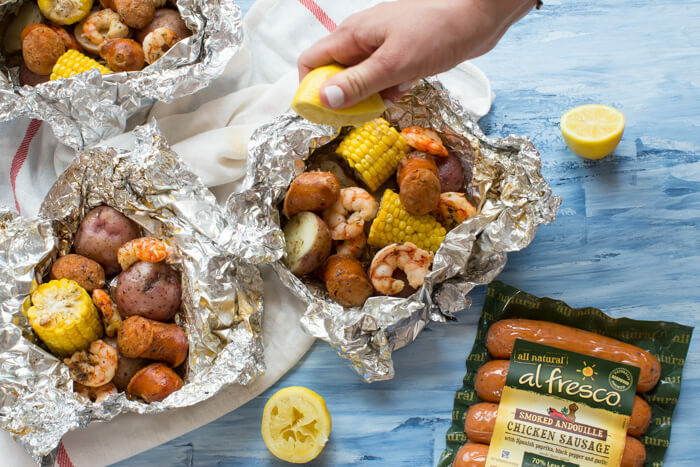 With al fresco sausage and a recipe like these Low Country Boil Foil Packs, dinner can be on the table in less than 30 minutes! Poke holes in potatoes and place on microwave safe bowl and cook on high for 3 minutes. Once cooled, slice in half. Using heavy duty foil, cut 4 sheets 18X12 inches. 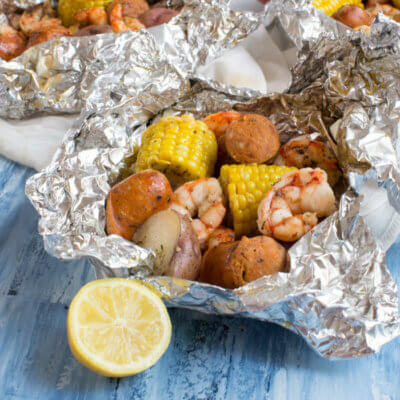 Divide shrimp, potatoes, corn and chicken sausage evenly and place in the center of each foil sheet; top each with ½ tablespoon drizzle of olive oil and sprinkle with salt, pepper and Italian seasoning. Fold up all sides of the foil packets to seal packets closed. Preheat grill over high heat, and grill packets and rotating to ensure even cooking for 15-20 minutes or until potatoes are cooked through. Sounds so good! Love Al Fresco sausages and love that there’s no washing dishes with these recipe! I love grilling season! These look so delicious! They’ll be a great addition to our grilling menu this summer! 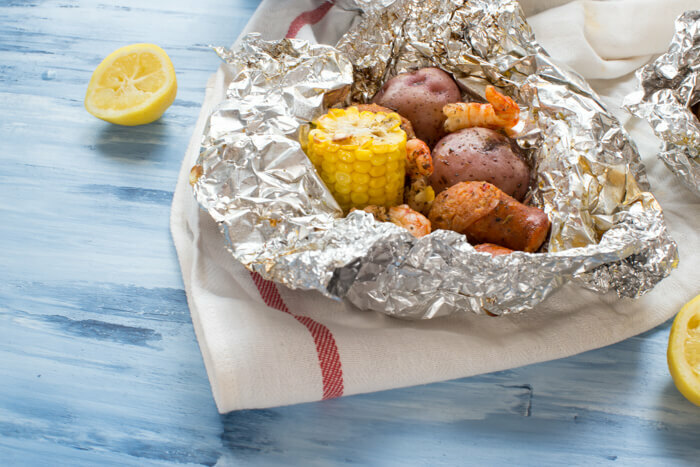 I love making foil packs in the summer – such an easy non-fuss dinners! 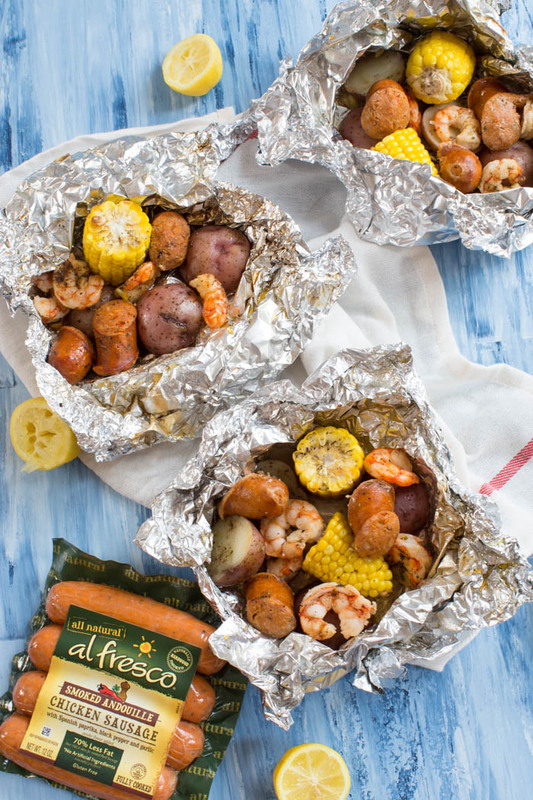 Love the idea of turning a low country boil into a foil pack – pure genius! 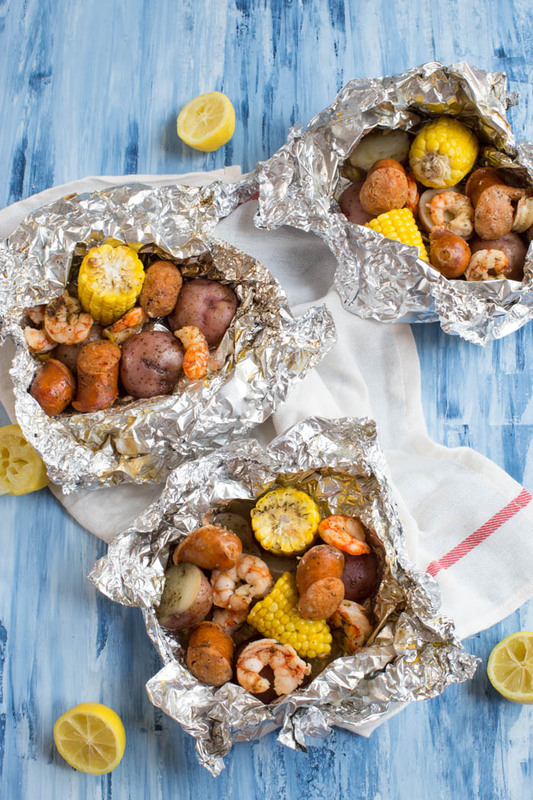 Love grilling food in foil, especially potatoes! We usually grill in foil when using coal. This looks really good! Shrimp boils are one of my all-time FAVORITE meals. We were invited to one when we were in college by a friend who moved from North Carolina. My life has never been the same. Definitely trying this version! YUM! Love love love these. My husband would really love them, too! Perfect for having friends over!